Unite are throwing open their doors again tonight - while hitting out at the causes of the homeless crisis. Photo: Sadiq Khan and Len McCluskey with St Mungo’s workers. The Unite union is giving shelter to homeless people amid freezing temperatures in London. 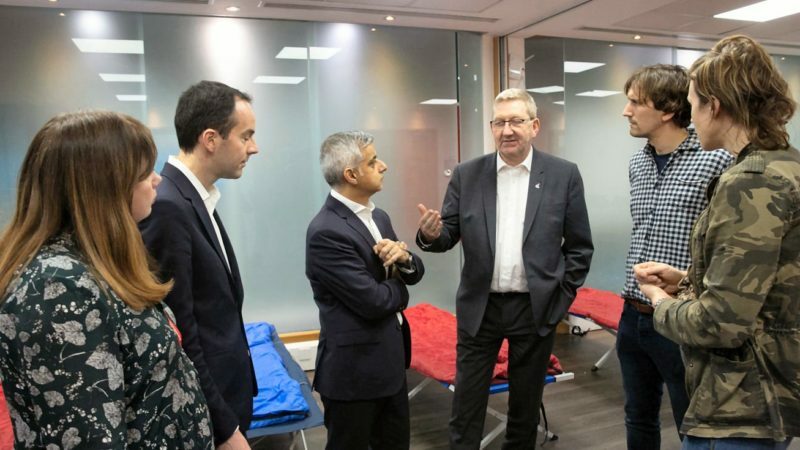 Unite has responded to the Mayor of London Sadiq Khan’s call to offer space for ‘pop up shelters’, with many of the capital’s shelters are already at over capacity. The mayor is working with homeless charity St Mungos which is servicing and staffing the shelters. The people who are homeless were being supported by St Mungo’s staff during their stay at Unite’s Holborn offices which started on Wednesday and looks set to continue over the weekend. This is the first time the London mayor’s ‘Severe Weather Emergency Provision’ programme has kicked into gear. Unite are set to provide assistance when temperatures drop to freezing. The number of people sleeping rough in London has increased by 13% according to the latest snapshot of local authorities in the capital. London accounts for 27 per cent of the total number of people sleeping rough in England, up from 24 per cent in 2017. Left Foot Forward spoke to Siobhan Endean, National Officer for the Community, Youth and Not-for-Profits in Unite, who works with the unionised St Mungo’s staff delivering support. But she hit out at the causes of homelessness, which includes ‘a lack of regulations in the private rental sector, and universal credit’. “Austerity is biting,” she said. “Unite has been proud to help out during these bitter cold nights, but we are under no illusion that so much more needs to be done to tackle this increasing tide of human misery. “No one should be sleeping rough in this freezing weather, which is why our emergency shelters are open across the capital every night the temperature drops to zero, offering rough sleepers somewhere warm to stay and further support to help them off the streets for good.